The Criteria to Establish an Employee or Independent Contractor is an employee classification law poster by the New Hampshire Department Of Labor. This is a mandatory posting for all employers in New Hampshire, and businesses who fail to comply may be subject to fines or sanctions. This poster must be posted in a conspicuous place where all employees and independent contractors will see it. This poster describes how to tell the difference between an Independent Contractor and an Employee. It appears you don't have a PDF plugin for this browser. 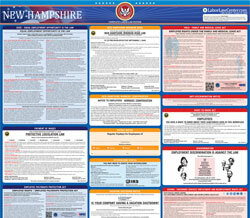 Please see the link below to download new-hampshire-employee-contractor-poster.pdf. bargained for by the employer. the person, and in the case of entertainment, the time such entertainment is to be presented. supervises the details of the assistants’ work. as a business	 and the person has continuing or recurring business liabilities or obligations	. failure to complete the work	. (g) The person is not required to work exclusively for the employer.